Pacquiao-Marquez fight is set for the fourth time around, that is why Saranggani Representative Manny Pacquiao has now booked his flight to USA for the finalization of that mentioned fight. The 'Pambansang Kamao' is said to fly to USA this Friday so to meet up with top Rank executive Bob Arum for the decision of the fourth Pacquiao-Marquez face-off. According to Salud, the main reason behind the fourth face-off is for the pay-per-view factor. However, Salud said that if ever our Filipino boxing champ would lose against Marquez in their fourth match, there will be a possibility that his fight against Floyd Mayweather will no longer happen. “Kung matalo siya kay Marquez, ‘yung [Floyd] Mayweather fight wala na. 'Yun ang fight na gusto ng mga tao,” he said. Well, let's just see what will happen in this fight. 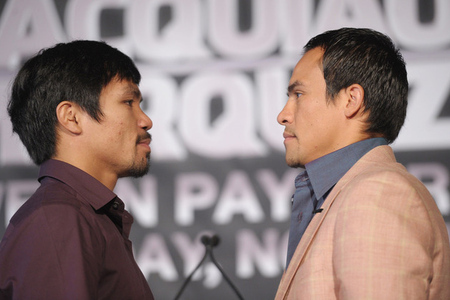 Either Paquiao or Marquez wins, both of them will surely take home a lot of money. Good luck!! Comments or suggestions about "To finalize Pacquiao-Marquez fight, Manny Pacquiao now flies to US" is important to us, you may share it by using the comment box below.